The past is like a foreign country, they do things differently there. That opening line could apply to the Smith-Madrone Vineyards and Winery. 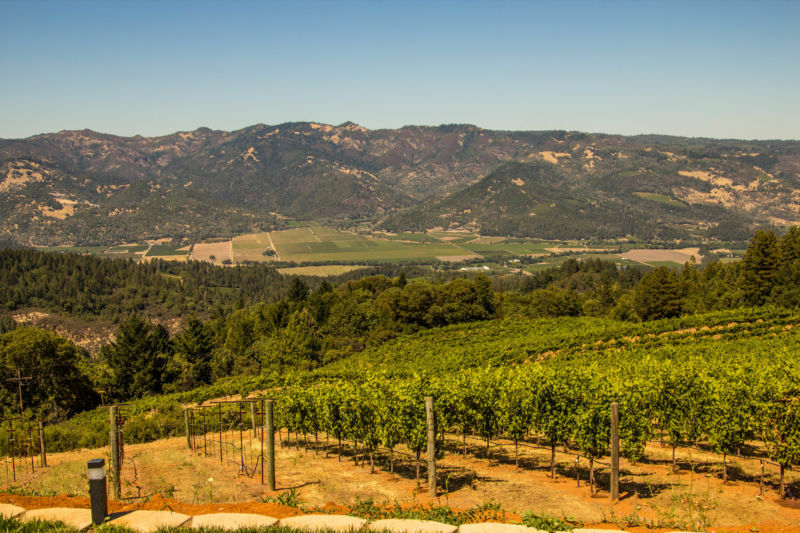 It is located only a few miles from Highway 29 and St. Helena, but it is a world and several decades removed from the tourist packed wineries that cluster along that main road. We drove five miles up Spring Mountain on a narrow and winding road; past signs warning that it was about to get more narrow and even more winding. We turned at a cluster of mailboxes and then followed a single track lane until we found a building in a clearing in the vines. There was nowhere further to drive, so we stopped and got out of the car. There is a small warehouse building, which serves as storage, office space, and tasting room. There is no sign of the fancy tasting room spaces that one sees in the wineries along the valley floor. California Girl Comments: The drive was really interesting. We passed forested areas with huge redwood trees on our trek up the mountain. I didn’t believe there could be a winery in this country location, but boy was I wrong. Not one, but many wineries inhabit Spring Mountain. Smith-Madrone was one of the first vineyards to inhabit this area. We were greeted by Curly, an English Spaniel, who was enthusiastically friendly. A few minutes later our host Stuart drove down the hill in an ATV. We climbed in the back and, as Curly gave chase, Stuart gave us a tour of the vineyard. California Girl Comments: What a cutie Curly is. He was such a handsome boy and posed for me in the vineyard like the gentleman he is. You can tell he’s well-loved. 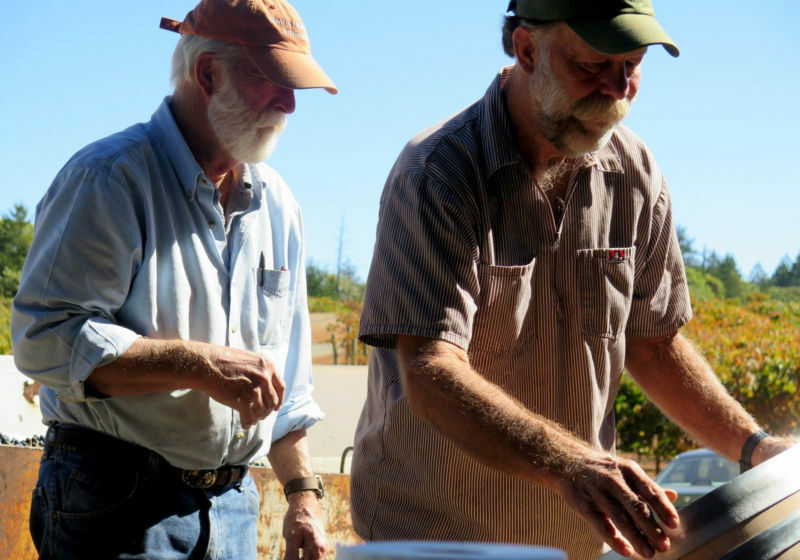 Stuart and his brother, Charles, have owned the vineyard since 1971. Before they could cultivate vines, they needed to clear trees that had grown since an earlier vineyard had been abandoned at the end of the Nineteenth Century. 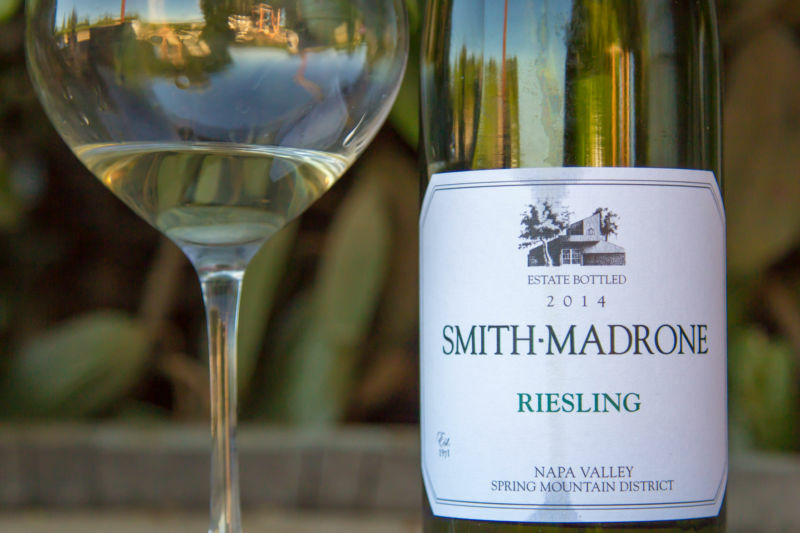 The trees removed included madrone, a species native to Western America, which in combination with their surname provided the winery’s name: Smith Madrone. 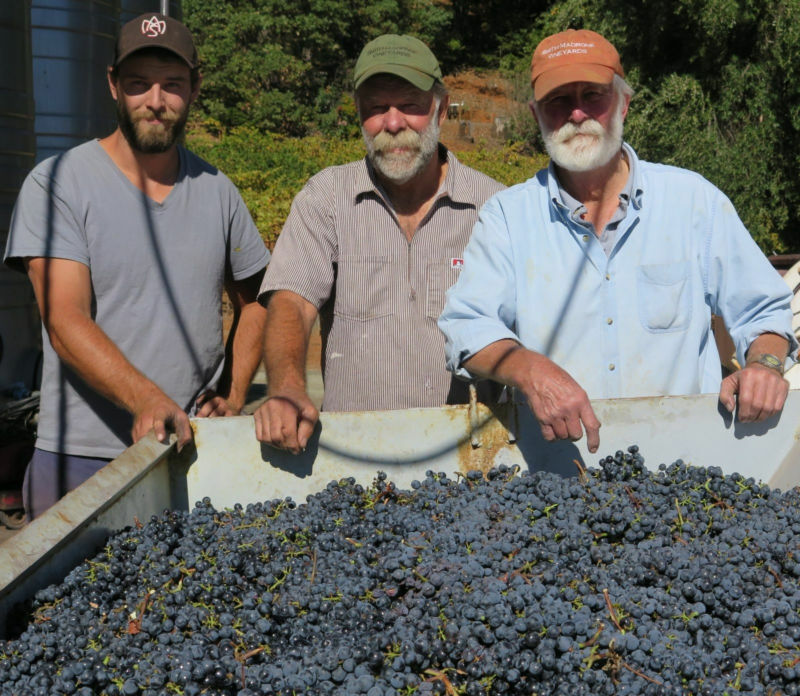 Stuart joked that Smith Winery lacked something as a name and that it was fortunate that there was variety of trees on the site, as Smith Poison Oak would also not have been the best choice. California Girl Comments: This year they celebrate 45 years of wine making. 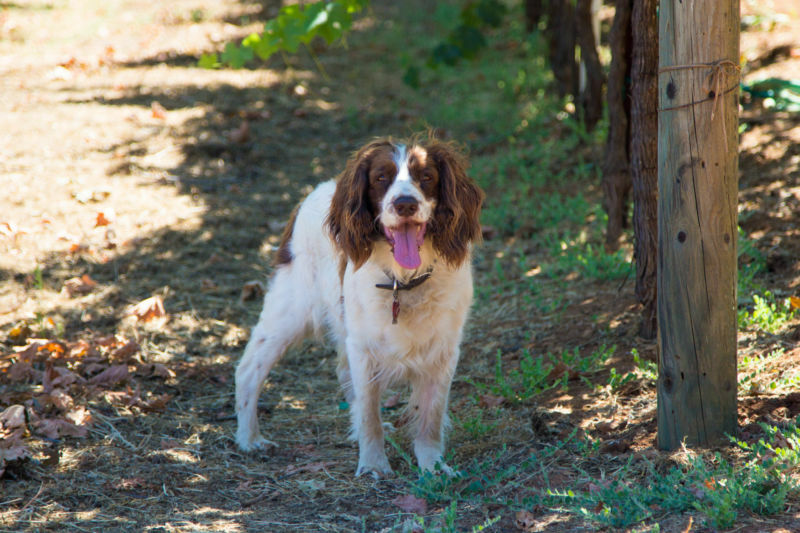 They have also welcomed Stuart’s son Sam into the family business as assistant wine maker. Sam brings to this experienced team youth and new ideas. The three work well together and it shows in the wine. The vineyard sits on the slopes of Spring Mountain. In some cases the gradient dictates planting the vines parallel to the slope to avoid steep ascents and descents when maintaining and harvesting. There are thirty-acres under vines. 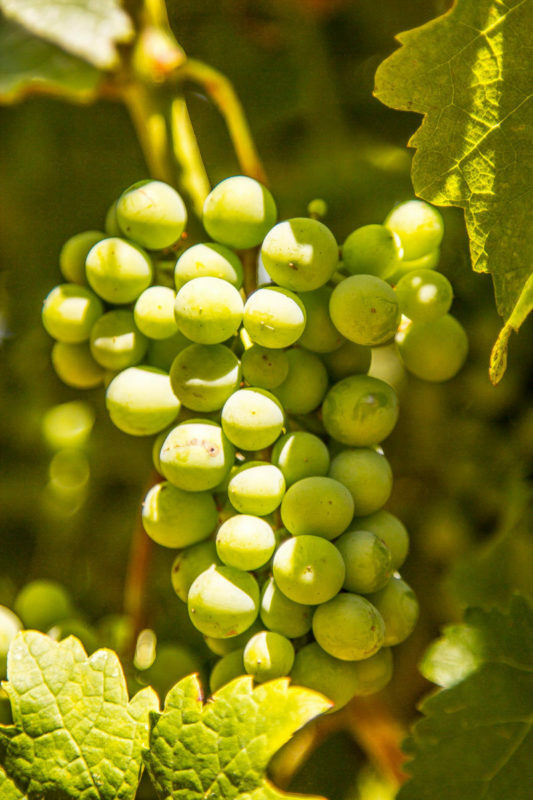 The grapes planted on the estate are Cabernet Sauvignon, Cabernet Franc, Merlot, Chardonnay, and Riesling. Stuart explained they dry-farm, providing extra water only for vines in the first few years of their life. He compared it to caring for children; lavishing care and attention in their early years and slowly enabling them to become more independent as they grow older. He admitted that some of their Merlot was an adult child returned home, as it needed ongoing watering. Stuart also explained how the leaves provide shade for the grapes so that they do not ripen too quickly and how they will trim the leaves back as the summer progresses to provide more sun in the morning and afternoon. California Girl Comments: It was so interesting listening to Stuart as he explained their philosophy of growing grapes and making wine. I could have listened to him for hours as he talked. He was both old school experience and new science geeky and we just loved it. Stuart stopped to show us the Cabernet Franc and pointed out how the vines are grown so that the fruit hangs 38 inches above the soil, reducing the amount of bending over that is needed during harvesting. This is one of many decisions they have made which reduce the yield of the vines, but help focus on the quality of the fruit. About halfway through our tour Curly decided that he had enough of chasing us and jumped into the back with California Girl and me. We did not think there was space on the back seat, but Curly was certain he would fit and once we both shifted to the side the dog was proven right. After the tour of the property, Stuart introduced us to his brother Charles, who took us through a tasting. We will cover that tasting in a subsequent post. California Girl Comments: The wine was just as interesting and special as the two brothers who make it. Both the Riesling and the Chardonnay are spectacular and very affordable. Charles spent time going through each and every wine tasting with us. It was wonderful. Smith-Madrone only does tasting visits two times a day on Monday, Wednesday, Friday and Saturday by appointment only. Check out their website for details about making a reservation here. Tastings are $25 and are about 1.5 hours. We loved our time with the brothers and this beautiful winery. We highly recommend you making the trip to visit. It is one of those really personal experiences in Napa that is a hidden treasure and you don’t want to miss.